One thing I love about being a Cybils panelist is that I always find a book that speaks to me perfectly. This past year I judged the first round of the young non-fiction category (ages 3-12 -- quite a span!). It was everything from simple picture books to thick war histories. There were 95 nominees and I read as many of them as I could. I loved this book. It tells part of the life story of Tuyet -- a young Vietnamese girl adopted by a Canadian family. The story of her emigration is told in the first book, Last Airlift: A Vietnamese Orphan's Rescue from War. 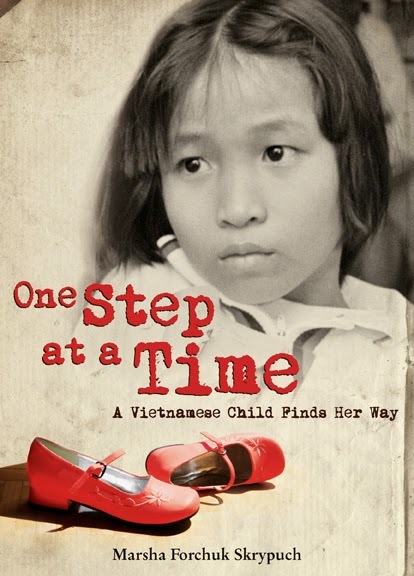 This second book, One Step at a Time, was all about Tuyet's adjustment to life in Canada and to the leg surgery her parents provided to help her recover from polio. One Step at a Time tells Tuyet's experience from her own eyes, and reads like an autobiography. The first-person perspective gives us a greater connection to Tuyet, and I think it also makes the text accessible to younger readers. There is just something engaging about reading "I didn't want to go to church!" instead of "Tuyet didn't want to go to church." As I read this book I had to share some of Tuyet's stories with Jacob. Now, months after reading the book, the experience that remains bright in my mind is the story of Tuyet's birthday. I can't remember now if the book said how old she was, but I pictured Tuyet at about age 10. Can you imagine a ten-year-old's wonder, bewilderment and excitement at seeing a balloon? Opening a present? Blowing the candles out for the very first time?! I loved that One Step at a Time showed Tuyet's joys and difficulties in adjusting to Canadian life. In general, the book is great for showing us a new perspective: look through the eyes of someone who was adopted as an older child. Look through the eyes of someone with a physical handicap. Look through the eyes of someone who doesn't speak English. I've told you now why the story is remarkable. Let me add the icing on the cake: the writing is so simple and clean it doesn't distract from the story at all. Because of that, this book would make an excellent read-aloud. There is no extra material. In a story like this it would be easy for the author to make the book sappy, like "My new life is all so magical!" It doesn't happen. It would be easy to smudge the story with dirt, "My life before was horrible and this is bad, too!" Skrypuch also avoids this. She writes in the perfect middle where matter-of-fact events meet with honest emotion. The writing style really gets out of the way of the story and hides so well that, unless you're looking closely, you don't even notice how well it is done. A few years back Ashley and I read and enjoyed Betti on the High Wire by Lisa Railsback. 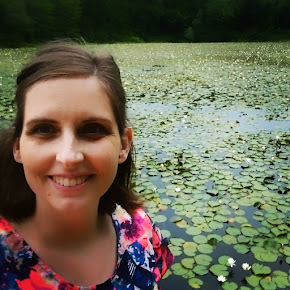 It is a similar story that is fictional, and was one of Ashley's favorites of that Cybils season. I liked Betti, but I must say One Step at a Time blows it out of the water! Don't get me wrong, if you like one, you'll probably like the other. But One Step was everything I wished Betti was. If you can only read one, I'd go with One Step at a Time. The only thing I didn't like about this book? It's cover. The cover makes it look super sad and boring, in my opinion. I can appreciate the fact that they used photographs on the cover -- the inclusion of some photographs in the book definitely enhanced the experience for me -- but. I don't know. You be the judge. If you hadn't read this review, would you pick up One Step at a Time: A Vietnamese Child Finds Her Way based on its cover? Leave me a comment. I'll be over here figuring out how I can get my hands on the first book. Thank you so much for the lovely review! My favourite incident to write was about Tueyt's first Canadian birthday celebration. Funny, poignant and eye-opening for a North American reader. You're so welcome. How fantastic that your favorite part to write was the most memorable part to me! Story Club: What do you need?